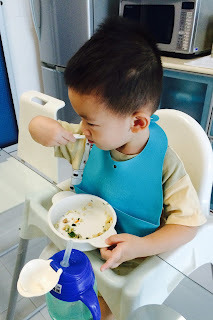 My Story, His Grace: Self-feeding... Finally! 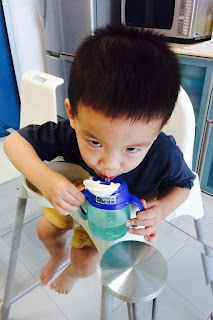 My older three kids learnt how to drink from a straw cup and self-feed at around one and a half years old. However, Joram refused to do so despite having the motor skills at two and a half years of age. Since he is the baby of the family, I could afford to let him take his time. For months, I've been coaxing him gently to try his hand at drinking from a straw cup or eat from the bowl by himself without any success. Yet, I was still willing to feed him food and water spoon by spoon every meal. Some time ago, we managed to "force" him to wear his own shoes by having the entire family wait for him at the door, refusing to help him. It was a long wait and there was a lot of crying from our boy but when he realised that he did not have a choice, he did it by himself eventually. That was when I figured that his high 'S' personality causes him to prefer to stay within his comfort zone till he is backed into a corner. As I prayed over the the past 2 months, I decided that I might have to also take the hard approach with regards to self-feeding. This is especially so since he will turn 3 next year and enter nursery. I don't think the teachers will have the patience to spoon-feed him food and water during lunchtime! My CG sisters rallied behind me in prayer too as I entered into a battle of wills today with my youngest son. 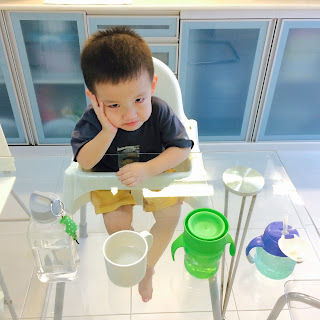 At breakfast, I placed a Mag Mag straw cup, a sippy cup, a narrow-mouth water bottle and a regular cup on the table for him to choose which to drink from. He screamed and cried for 2 hours, and kept asking me to feed him the water using the spoon as I'd always done so. 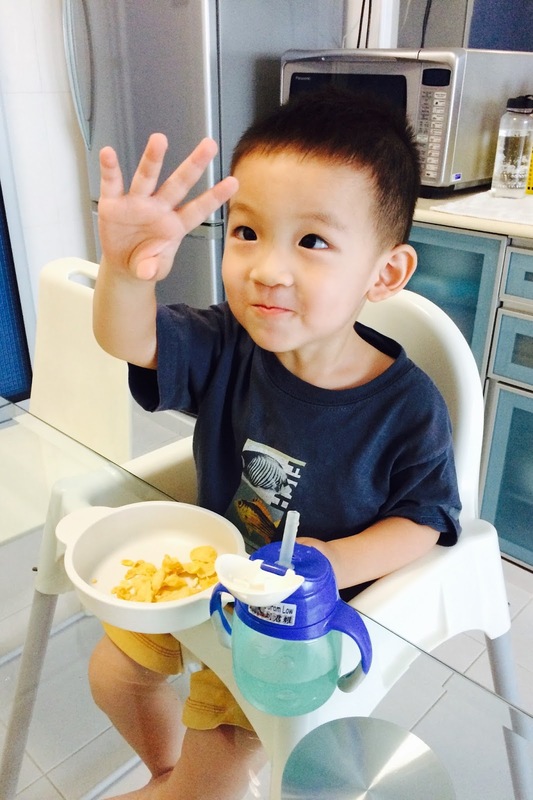 I simply reiterated that he is already a big boy now and is definitely able to drink water by himself. I was feeling very disheartened when the Holy Spirit prompted me to remember his introvert and shy nature. I thought that he might be upset with all the attention he was getting. Thus, I dismissed his sisters to their room to play and went into my bedroom, leaving Joram alone in the dining room with the 4 choices. 15 min later, I went out to find him drinking from the Mag Mag cup, the one which is the most familiar to him! (The older three used this very cup when they first learnt to drink on their own.) Hallelujah! At lunch, Joram resisted self-feeding again. I tried persuading him by praising him for his earlier achievements but he was still upset. Yet again, the Holy Spirit inspired me to take out photos of the older three children when they first started self feeding. I told him I would like to take some photos of him eating by himself too. Amazingly, he actually obliged after that, all the while asking me to take more pictures of him while he ate! The rest is history. He could even use a fork to eat apples during tea break. Thank God for answering our prayers!